Just three days ago we started the WonderFox Halloween Giveaway under which you could get exciting paid products for free (valid up to November 8th). We thought of bringing some more cool stuff for all our fans, but sadly we got a little late. But don’t worry!! 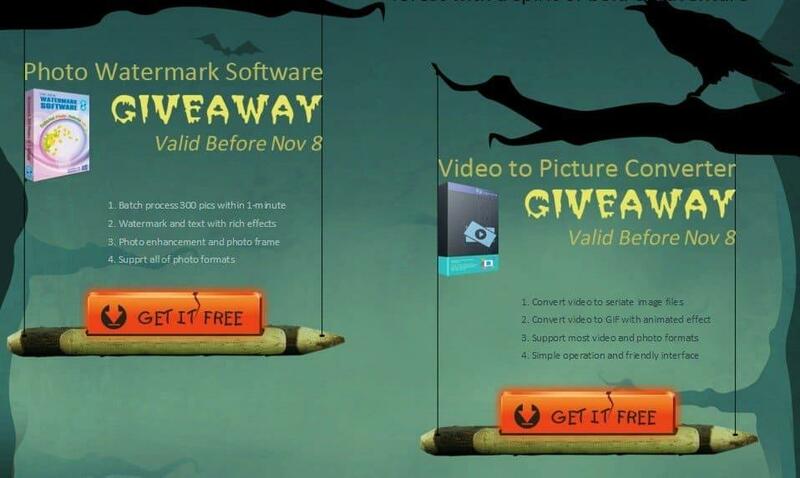 We’re back with another Halloween Giveaway this time we have a Photo Watermark Software and a Video to Picture Converter from AoaoPhoto Digital Studio. Sounds cool? Okay, let’s take a look at both of the products that we are giving away to all our fans. Most of you must have been conscious about keeping your photos and videos on the web safe and secure and the best way to do that is to add a watermark, which may include text or your company or brand logo. Also, with this you can add borders, adjust the image and do a lot more. Supports a vast range of image formats like JPG, GIF, BMP, PNG, TGA, TIF, ICO, PCX, etc. You can also get the lifetime license for $24.95 (list price $29.95) which will help you get lifetime updates for free. Also, you can do the following to get a lifetime licence for free. Wouldn’t it be awesome if you can share a special moment from any videos that you have captured or maybe you can make a funny moment meme in GIF and upload it to Facebook? Video to Picture Converter does that job for you in a very efficient way. And yes, that’s not all. All of the users have a chance to get the lifetime license for $19.95 (list price $29.95). The Lifetime licence will allow you to get lifetime upgrades for free. Also, you can get the lifetime licence for free. Just follow the steps below to get it. Yes, you read that right. You can get a full lifetime licence for free when you share them on social media. Just follow the steps below and claim. Step 2: Send the shared URL to our partner email alicebrown@watermark-software.com, and then you will get the lifetime license within two business day.